We have been contacted by a lot of people asking for us to help with this issue that a radio stations 3 hosts NJ 101.5 has said. From the reports I have gathered it happened on May 21, 2013, there is also a flier circulating around the social networks. 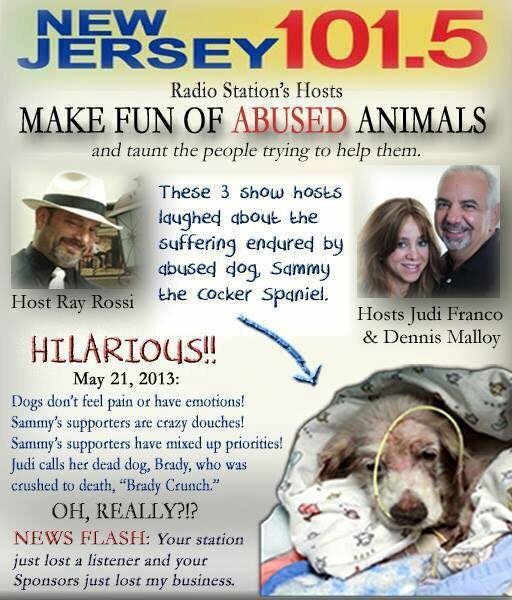 These 3 Radio hosts do indeed support animal abuse, along with human abuse since they have been known to terrorize their listeners and laugh at them, whenever someone becomes defensive or has something that is intelligent and right to say. Elephants mourning the loss of their Matriarch, Animals do feel emotion and pain. This dog waited at the train station everyday, every month for his owner to return. His owner never returned because his owner died. Explain to me if dogs do not feel emotion why was Hachiko waiting? These 3 hosts mocked and poked fun at Sammy. These 3 hosts stated that animal advocates and activists do not have their priorities straight. Well Ray, Judi, and Dennis. I love to break this to you, we do have our priorities straight, we know full well how animals have emotions and can feel pain. Do dogs not yelp or whimper when they are injured? Yes they do. Do dogs not get excited when you return home? Yes THEY DO. Do dogs not "Feel" playful when you play fetch or other games with them? YES THEY DO. Do dogs not show the signs of anger? Yes they do, They also get frustrated confused, and bored. All feelings am I correct? I believe and Know I am correct. Quite Frankly I see this as, Judi, Dennis and Ray need to be retired off the air, for mentally unstable purposes. If these 3 continue to be on the air, the station will continue to lose ratings, and listeners. So unless you want your station to be sort to speak FORGOTTEN, I would take this liberty of letting those 3 go, and finding replacements OR there is an alternative, which is a public apology and them going to Animal Education Awareness Classes. We as the advocates for all breeds and animals are not BLIND, DEAF, OR MUTE. We see, we hear, and we do speak out against people who make fun, mock and or joins in on the abuse. We will not be silent, we will not be blinded, we will not be made deaf or lose our voices. We will not turn our backs to this treacherousness act of hatred towards man/woman's counterparts. These animals might not have a voice of their own to speak of their pain, however, that is why we are here. We are here to be their voice their messenger! 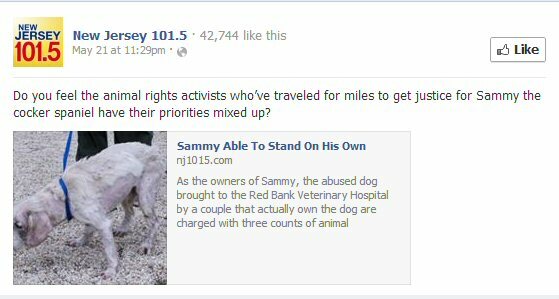 What happen to Sammy was a disgrace, it was cruelty, it was a heinous act toward a defenseless animal. And Thank you everyone for all of your support! plain dumb idiots these 'hosts'are; it's a shame they can go ahead with their evil trash, they're from the very dark ages, knowing even less than a 1 year old!